“Order picking accounts for 50-75 percent of operating costs for the typical warehouse. 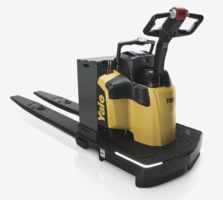 What's more, operator productivity can decline by as much as 30 percent near the end of a shift,” says Chris Murtha Brand Manager, Yale Materials Handling Corporation. "We worked to address these pressures with the new end rider, and it shows. The truck is designed to keep total cost of operation to a minimum and packs a laundry list of features to keep operators focused and productive."